GPR Stabilizers are precision-machined for proven reliability and superior quality. 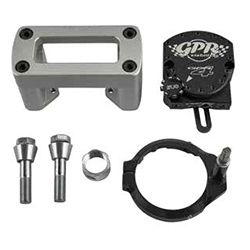 Kit comes with the GPRV1 stabilizer and billet-machined mounting brackets. The patented “pin-less” mounting brackets eliminates any slop that might normally exist with the traditional aftermarket pin-and-slot mounting systems. Easy installation provides bolt-on performance. No drilling, tapping, or welding required. Intended to fit with OEM bars.